I'm warped up now. It took a whole afternoon and some of the evening, and I've only used a part of the width of this slim loom (96 ends) and four of the eight shafts. 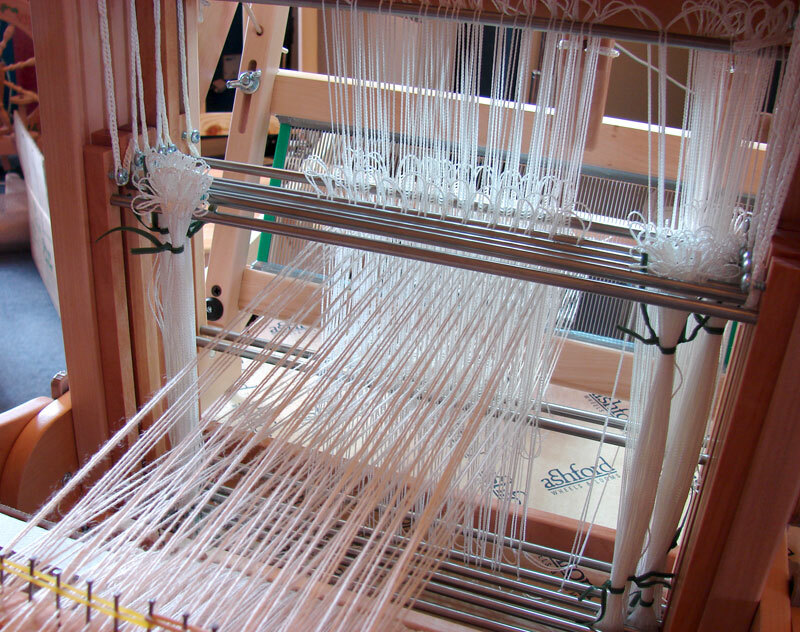 I can't imagine getting to grips with this if I wasn't already familiar with warping up my knitters loom, and it's difficult to imagine how long it would take to fill the width of one of the wider looms. The few passes of chunky yarn is a heading - to spread the threads out evenly after the knots. This is also useful to test whether the warp ends are all threaded properly (they weren't) and give you a chance to sort any problems out before you go any further (I did). 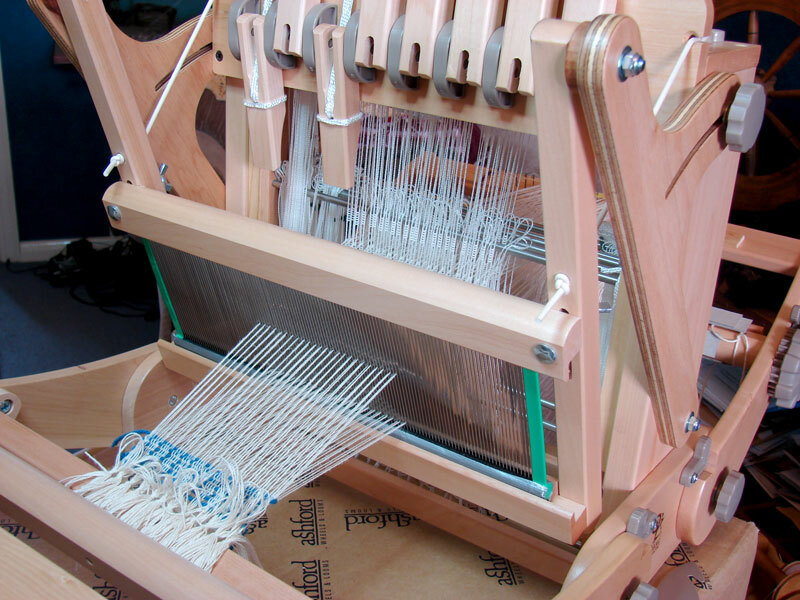 Oh gosh...I really really don't think I will even need a 4 shaft loom let alone an 8 shaft one, I will just stick with my Kromski Harp, which is sadly under used! lol - it's a workout mentally as well as physically, but that's making it so enjoyable. 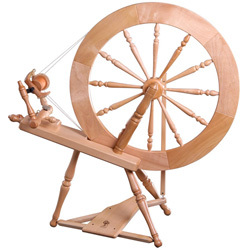 Hey - that's one of the new Ashford looms! What fun. I quite agree about learning to weave being a mental workout, are you starting to think in 3D yet? It's an amazing experience when you come from art being marks on paper to the complex interactions in weaving. Hi Dorothy, it is indeed the new Katie! She's beautiful. 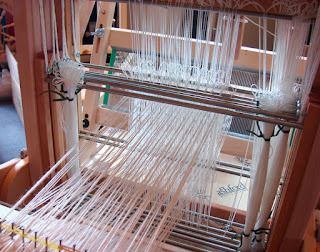 I'm starting to get my head around the pattern drafts, not something I'd got into with the knitter's loom. it's so exciting, and I'm sure the 3d thinking will come as I start to try different patterns. The thought of using very fine thread (as here) has appealed to me for a while, so glad to be trying that, but I'm also looking forward to using my own handspun too. I am humbled. The loom looks impressive, but as I haven't progressed beyond my 2nd scarf, and plain weave, I'll just watch, if you don't mind.